Discover total relaxation at this remodeled 1940s adobe studio, complete with stylish Southwest decor and a painted tin ceiling. Enjoy a movie night curled up in front of the gas stove or take in the stars from the cozy private patio. 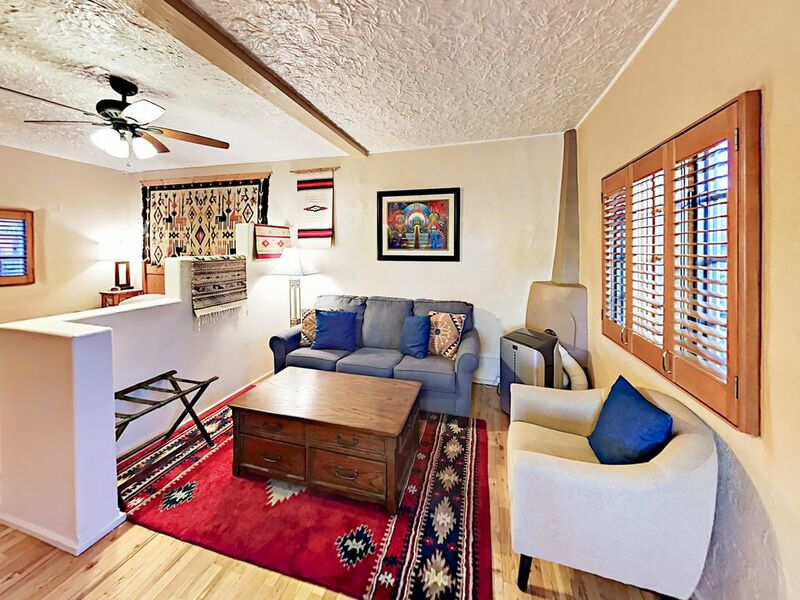 This condo is nestled in a quiet pocket of Santa Fe, giving you easy access to everything you need to fully enjoy your vacation. You’re within walking distance of delicious restaurants, local boutiques, eclectic art galleries, and city landmarks. Spend the day meandering around Santa Fe Plaza, explore Canyon Road, or head out into the natural surroundings for a day of adventure. Relax on the plush sleeper sofa and armchair in front of the gas stove. Enjoy your favorite shows on the 32” flat-screen TV equipped with cable. Feel right at home in the freshly remodeled kitchen, outfitted with new appliances and all the kitchenware you need. Enjoy intimate meals together at the dining nook with seating for four. This studio sleeps four guests between a king-size bed and a queen-size sleeper sofa. The full bathroom includes a tub/shower combination and a complimentary starter supply of toiletries and bath amenities. Enjoy an alfresco dinner for two on the private patio shaded by a plum tree. This dog-friendly condo includes complimentary Wi-Fi, a portable air conditioner, and driveway parking for one vehicle. Take an easy 10-minute stroll to Santa Fe Plaza, where you can dine at local restaurants, peruse art galleries, and shop boutiques. Take time to tour Loretto Chapel, the Georgia O’Keeffe Museum, and New Mexico History Museum, among others. Explore the native scenery on the numerous hike and bike trails in the area, including Hyde Memorial State Park (8 miles), Rabbit Road Trailhead (6 miles), and Frenchy’s Field (3 miles). We thoroughly enjoyed our stay in this quaint little adobe studio. The studio was decorated Santa Fe style, it was very clean and well maintained. The location was perfect - just a short walk to the plaza, coffee shops and restaurants. The management company was very responsive to any questions. I would highly recommend this property. My only negative comment would be regarding the availability of channels on the TV. Santa Fe is a very eclectic, unique place to visit!! close to coffee (Sage Bakehouse). good parking. central location. modern kitchen and bath. Would return.